Heavy-duty power or manual rewind reels designed for use with single conductor electrode cable or for grounding cable. Handles from 45 ft. up to 85 ft. of 3/2 to #2 cable. Portable, manual, rewind reels with carrying handle and rubber pads. 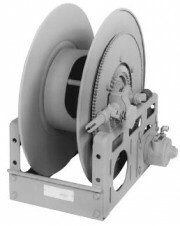 Reel is designed for single-conductor operation with electrode cable.